Look at this cheeky sock monkey! The crew can`t wait to make one but they will need some help. This is my first and I`m going to show you how to make him KKC style. You need a pair of socks with a contrasting heal and toe. They don`t need to be stripey though but they look good in stripes too. I bought these long pair of cheap socks so I could make the arms, legs and tail longer. I am going to show you my way of making them that cuts out a lot of sewing by hand and you get a stronger and neater finish. Section the socks off where I have marked in red. Some of the red edges on the body are for slits to insert the arms, ears, and tail once they are sewn and stuffed. The green line has to be stitched before cutting to keep it easy. Because the socks were nice and long, I had lots of fabric to work with. So I cut the other arm out of the piece left over from the body. It is not shown in the picture. Once you sew the leg seams you can cut but leave an opening where you see the red line. This opening will be the last to be sewn after attaching the arms, ears, and tail and stuffing the body and legs. Notice the slits for the limbs indicated by the white arrows and red lines. 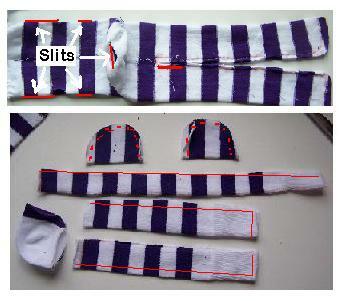 Turn the pieces inside out and sew along their edges. Check and double stitch. You need to cut open the folded strait edge on the ears. Finished sewing the pieces? It`s time to stuff the arms and tail with some polyester filling. You can buy this in the craft shop or haberdashery. Take small pieces and push them inside to the end with a long thin object. I used a wooden skewer which gripped the filling better as I pushed it down the tubes. You can put a little filling in the ears but not a lot. Just enough to give them body. Don`t fill the body and legs before you attach these pieces. You should end up with the limbs on the inside of the body. Pull the ends of them out of the opening for the tail on the heal so they are showing. After you machine stitch the limbs to the body, making sure all the raw edges are caught and double stitched, you will be able to pull the whole sock monkey out through it. Pull the sock monkey right side out. It is beginning to look like one now. You should only have two gaps left. The slit for the tail and the opening in the leg seam. Take the tail end first, and put it inside the monkey through the slit in the heal and then come part way out of the leg seam. Pin the raw edges to the heal slit and machine stitch across, catching all. Double stitch after checking. 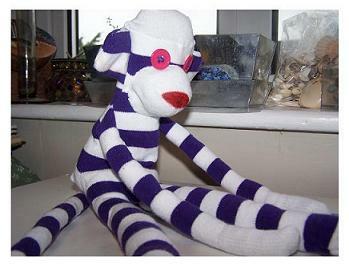 Now pull the whole sock monkey out through the leg seam and stuff the legs and body. Slip stitch to close the leg seam. You need to put a mouth on the face of your sock monkey. Take the cut out heal and back stitch half of the inside, right side to left to the bottom of the face curving up at both ends. Stuff the nose at this point, but don`t over stuff. Turn the edge in and lip stitch the rest, curving as you go. When you have finished sew on buttons for the eyes and you can draw in the mouth with felt tip pens or use red felt fabric. Doesn`t he looked great! More Sewing crafts that are fun to make.